An interview with the director of The Confession, Moazzam Begg’s story commissioned by BBC Storyville and the BFI - one of the most resonant modern stories for our times. 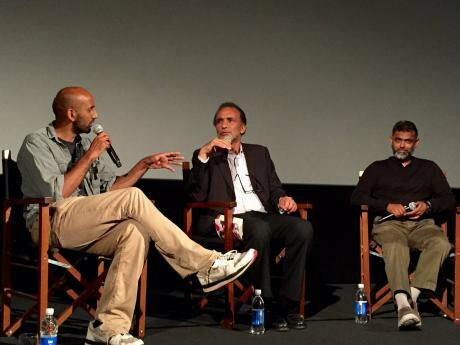 Ashish Ghadiali,Tariq Ramadan and Moazzam Begg in studio conversation about 'The Confession', 2016. All rights reserved.Rosemary Bechler (RB): This summer you have been on tour around Britain with showings of your documentary film, The Confession, followed by studio chats with Moazzam Begg – what drew you to this man and this process? Ashish Ghadiali (Ashish): I set out to make a cinematic documentary. I felt it was important to get this story and this character into a space where it wasn’t being cut down to 10-second soundbites. When I asked Moazzam if he would be interested in participating in this project, I said to him that my sense was that although he was ubiquitous, he had become a kind of cardboard cut-out within the framework of contemporary media, someone who was wheeled on to represent a point of view that was already pre-packaged and formulated. I thought it was important to give space to the experience and to the humanity of the man in order to understand better what I think has been a cultural shift in Britain and around the world, under the heading of the ‘war on terror’. It was important to… understand better what I think has been a cultural shift in Britain and around the world, under the heading of the ‘war on terror’. RB: Is that something that has concerned you for a long time, Ashish? Ashish: Yes, instantly. Because my life changed, maybe slowly from 9/11 to 7/7, but there was a sense of something in the air. After the July 2005 terror attacks, I was suddenly being stopped and searched maybe once, maybe twice on the way to work, and that was upsetting because it was very clearly racial profiling. I would go into work in situations where I was the only non-white person in the room, and express that feeling of different treatment, and find that there was often sympathy, but often something less than sympathetic, a sort of growing sense that maybe it was OK that extra precautions were being taken, and that it wasn’t the end of the world, was it? People were scared, and they thought it was an understandable reaction. I too understood all of that. But it was a rupture in my own sense of identity. There I was, a very confident British citizen, being asked by my Oxbridge-educated peers, people with ambitions to be the establishment, to get my head around accepting this different sort of treatment. With that acceptance, of course, they were entering a different way of thinking that basically denies my equality. I reacted really strongly. I was working in television at the time and my job was to develop ideas within factual entertainment and I was the only brown face in the team. For me it became essential that we now started to reflect on these issues that were going on, on the ground. The idea that this experience was my niche experience and not part of our collective experience was damaging. Up until that point British multiculturalism was something that we were proud of. This was before Trevor Phillips, who was made Chair of the Commission for Racial Equality, became a pioneer of the shakedown. I was close to that whole thing. I used to work for one of his close friends, the company that made the recent Trevor Phillips film about ‘what British Muslims really think’. At the time, I remember his criticism of multiculturalism seemed outrageous, the ambition of someone trying to work his way deeper into the establishment. But it didn’t feel threatening. It didn’t seem to threaten my multiculturalism, which was simply hegemonic. After 7/7, however, one instantly entered a different world, of living in someone else’s paranoia. I tried to push that experience through within my work and it was immediately bounced back at me as being ‘niche’. Token efforts not to shut it down would quickly descend into farce. The closest I did get to expressing anything on the subject, I remember, was talking to an Evening Standard reporter about it outside Whitechapel tube station on the way to work. That ended up with a photo of me in the paper and a strapline saying, “I feel like a pariah” – which then became a running joke. The response in the workplace was to get that, and stick it up on the wall! All in all, the experience of that time made me distrust the media establishment as a place where I would be able to express my voice. The idea that this experience was my niche experience and not part of our collective experience was damaging. At this point, one has to foreground the fact that the BBC commissioned this film, The Confession. It would not have got off the ground had it not been for them! But in 2005 I quit my job in TV and left the UK, because of my very strong reaction to this. By chance, in between the two terrorist attacks I went on a holiday to India and there was another terrorist attack there. But nobody suspected me of being part of the problem in India. So up till then I had been speaking about this issue of race in optimistic terms – that is for 25 years – as a British Asian. It had always seemed to me that my identity was something that the culture embraced, as represented in the novels of Hanif Kuresihi or Zadie Smith, the works of Talvin Singh or Nitin Sawney. This was something I was very confident about – despite the fact that there had always been a whisper that says, “You are not the same as the white majority and they don’t think of you as the same.” But up till then it was not a voice I gave much time to. All of a sudden it was a takeover, a wakeup call, you know! It’s time to think about race – it really is time for me to understand myself through the lens of race. It filled me with a great desire to understand the experience of non-white people in the world. And it filled me with a great desire to understand the experience of non-white people in the world. There are many borders dividing them and it is a fragmented world, but it is one in which I can sit in a tourist site in Iran and until I speak, people are convinced that I am Iranian. In Egypt or Palestine, Singapore or India, it is the same. For ten years my experience was across all of those spaces, and I really needed that to build up a new rooted sense of self. That is what I had to do at the time. To be honest, it was probably an artist’s journey, in search of identity, much in the same terms that Moazzam Begg frames his story about travelling out across the Islamic world in quest of his own identity as a Muslim. And there were mirrors of the same sort of quest undertaken by relatively privileged people that I read along the way. At some point along that journey, I wasn’t sure if I was coming back to the UK. I could see the way that things were turning – like the concerted declaration of the failure of multiculturalism – that didn’t fill me with any sense that something good was going to come out of all this. The reports from back home were of the rise of the EDL, of UKIP’s progress across England, and I was thinking about the ongoing legacy of colonialism and wondering about an authentic way of living in the world. I went to film school in Singapore for three years and then I started looking around for opportunities. It was about economic opportunity as much as anything, and ambition, wanting to make the films I wanted to make, and looking around for a place to make those films where I wasn’t ‘niche’. I worked in Bollywood for a year. I set up a film unit in Jenin refugee camp. I was a peripatetic screenwriter for a while living between Berlin and the south of Italy and working on commissions for an Austrian producer, so there were various experiments. Eventually I came to the realization that I was longing for Britain, wet weather, Derbyshire where I grew up. Eventually I came to the realization that I was longing for Britain, wet weather, Derbyshire where I grew up. So in the year before I started this project with Moazzam Begg, I ended up living in the house that I grew up in and clearing it out, clearing out thirty years of ‘stuff’, and realizing how much more polarized things had become, how deeply undermined the language of multiculturalism had been, how real the rise of UKIP was. We didn’t know that Brexit was imminent, but we did know that there had been a material change. One thing that really did that for me was the 2012 Jubilee! Suddenly I lived in Royalist Central. That had never been the case previously – so much fanfare and flag-waving took place that summer. I felt kind of removed from it. But as I was really trying to understand that question of identity, it also became absolutely clear to me that Britain was my home, and that multiculturalism wasn’t just an idea, but a lived reality for all of us. Our ability or inability to digest that is very much the battleground of the twenty-first century. It became very, very clear to me that my role, my artistic journey, demanded of me that my voice express that reality. And that actually if you looked at it with a long lens – that little blip – you know, Robin Cook’s chicken tikka masala moment, switched off by Cameron’s ‘failure of multiculturalism’, is simply not the story. Our ability or inability to digest diversity is very much the battleground of the twenty-first century. The story is ultimately the story of human history, and the migrations of the twentieth century are really only the seeds of a new way of living collectively, that must emerge. But the culture for that process hasn’t yet been created, and that is our job. RB: I have been talking to Nando Sigona from Birmingham University about superdiversity in the UK and everywhere else. It seems remarkable, given the rapidly evolving levels of mixture by no means confined to London, that we are so in denial, and trapped by an ascendant, monocultural National Us. Ashish: There is a direct line, I think, from the rhetoric of ‘integration’ to the bombing of civilians in Syria. That kind of liberal interventionist muscle comes from the same place as that call for ‘integration’ meaning assimilation. Nobody calls for the ‘integration’ of Etonian Cabinet ministers – they should do! – but the sheer arrogance of that call for you to ‘integrate’ with me – this is obviously not a viable offer, and so it is always going to be disappointed, and so the result is always going to be violence. Anyway, I spent that year in the house of my childhood, and in the summer of 2014, at exactly the same time, ISIS conquered Mosul. Videos started to appear of British foreign fighters in the Middle East and a new wave of hysteria rose up. And I had a different lens on it. I was now engaging with the media as a construct and not as my reality. Let’s be clear, the war on terror was an utter failure. Terrorism is a much much greater problem now than it was in 2001, and there is a fairly clear line of causality running from the responses of the American and the British governments to the roots of the terrorism on the ascendant now. Why this is, is a difficult thing to talk about, because we live in an era of epic secrecy. We don’t know. And it is very important not to be mistaken for a conspiracy theorist when dealing with this material. But it is also really important to my bigger project that I don’t want more polarisation. I want more collective thinking and more rationality. Nobody calls for the ‘integration’ of Etonian Cabinet ministers – they should do! So there are two ways of looking at it. There is the great conspiracy theory that a bunch of neocons sat around and realised that if they go for the oil, create chaos in the Middle East, then that is basically an opportunity to consolidate the military industrial complex and dominate the twenty first century. There is a second way of looking at it, which is that in a unipolar world, asymmetrical warfare was always likely to escalate as a strategy, and that you are dealing at some level with consciousness, and degrees of consciousness. On the project I was working on in the Jenin refugee camp where I lived, the idea was to give an opportunity for self-expression and voice to a community that had been devastated by the 2002 Operation Defensive Shield, which was, at the time, the location of the highest concentration of suicide bombers in the world. In a place like that, what is it that appears to a young teenage boy living in those conditions as a political act ? What it is might be entirely counter-productive. It might sow the seeds for the total decimation of his people, of his way of life, and it might feed into the spectacle that counter-insurgency requires to justify its own excesses. But the fear that comes from terrorism, while it is also manufactured, is also real. And so it simply leads to a process of escalation. This account says that there is no great mind behind it all. But that what we are witnessing is actually a failure of mind. So my conclusion is this. Let’s assume the latter. Because the problem with the war on terror and the problem that it has made dominant, is that too many people make unfounded accusations, accusations not founded in evidence. I was now engaging with the media as a construct and not as my reality. Let’s assume it is the latter and that one thing has led to another and is spiralling out of control. What do we as concerned citizens need to worry about? What is the course of action that we need to start pursuing ? To my mind what we need to address is that this is leading towards the destruction of our civil liberties and our basic freedoms, and the rise of a new authoritarianism that is increasingly taking over aspects of western democracy, Donald Trump not being the least of these threats. That new authoritarianism is seeking in all kinds of ways to limit the space for political oppositional forms, whether it is through trade unions, forms of freedom of expression in schools or universities, whether it is the right of health workers to maintain the confidence of their patients, or social workers to maintain the confidence of their clients. All of these aspects of civilization as we know it are up for grabs at the moment. And so the rational attitude that I feel we need much more of now is just to look at that and say – OK, well, first of all, is this what we want? I believe that the majority of British citizens don’t want to live in a world where they are less free. That this is not the arc that is desired for the twenty first century. So, then we must ask, what is the narrative that has been driving this? And why? And I think art might be a key protagonist in all this. Next week: Moazzam Begg and The Confession.